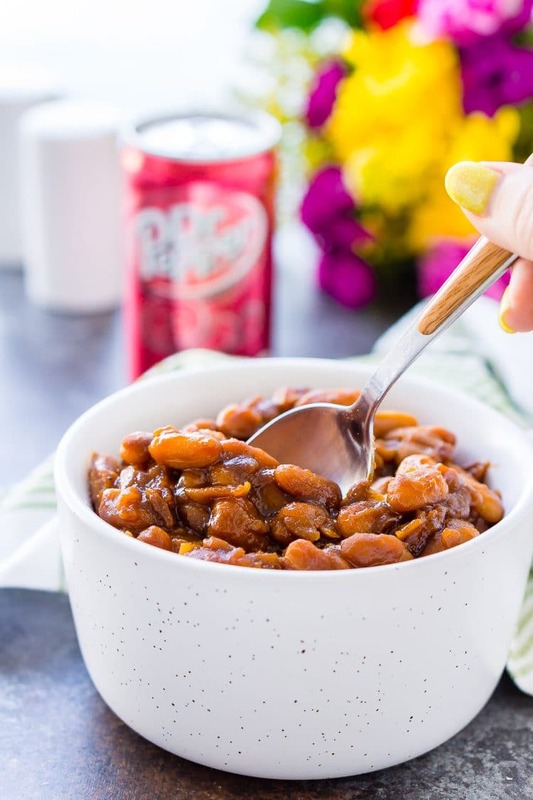 These Dr Pepper Baked Beans are a sweet and delicious side dish that’s ready in less than an hour! Perfect for BBQ’s and game day parties! When most people think of Maine and food, they think of lobster or blueberries. While those two things are iconic for our state, it’s the baked beans that are CLASSIC Maine. Growing up, the weekends were always filled with baked bean suppers at the Grange hall, it was a part of life and a family tradition. And one of these days I’m going to track down my grandfather’s baked beans recipe. Traditionally, they’re called Bean-Hole Beans and they’re baked in a cast iron pot in the ground. But it’s November and the ground is getting ready to freeze and most individuals don’t feel like digging a hole to put their dinner in! So today I’m doing a bit of a twist on the down-home classic. Buy My Favorite Dutch Oven! We’re keeping the essentials: molasses and ground mustard. But we’re adding in some Dr Pepper (you can actually use any dark cola you want!) and making them with a combination of stovetop cooking and oven baking. Buy My Favorite Ground Mustard! 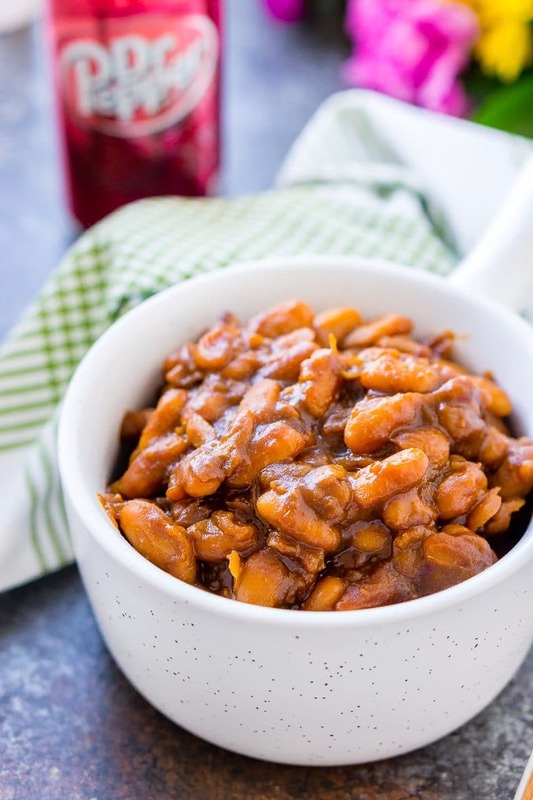 What I love most about these baked beans is that it’s a super fast recipe in comparison to the traditional cooking method. Instead of the 18 to 24 hours, it takes to cook baked beans from scratch, we’re going to knock it down to just 40 minutes! Sound good? Plus, when you have a great and quick recipe in your pocket, you’re always prepared! Baked beans are great as a full meal and also make an excellent side dish for Thanksgiving and game days! Plus there are so many different ways to prepare them and so many different flavors. Some like them spicy and I LOVE adding peaches to mine every once in awhile. Some add bacon and some add salt pork and then there are recipes like this that have neither. It’s all up to you. But if you’re looking for a recipe that’s quick and delicious, go for this one. 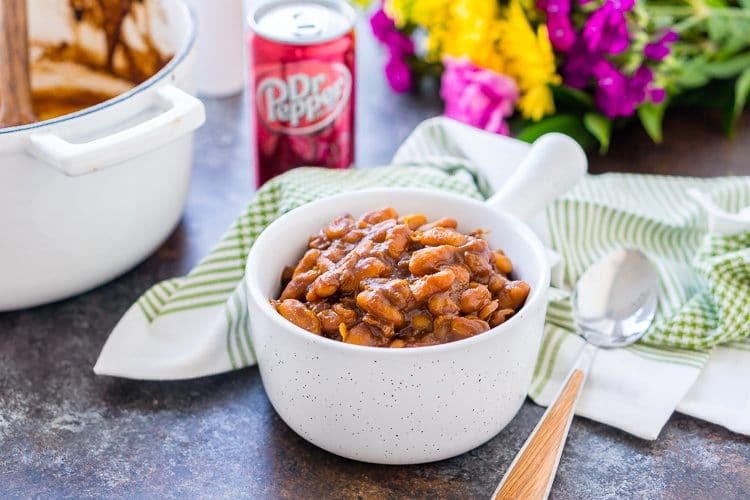 With the addition of Dr Pepper and it’s 23 flavors to the recipe, we’re able to make up for any flavor we might have lost from speeding up the cooking process! What’s your favorite way to make baked beans? 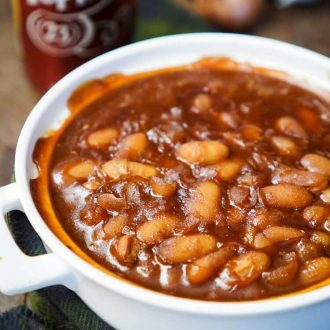 Watch how to make these baked beans in the video below! 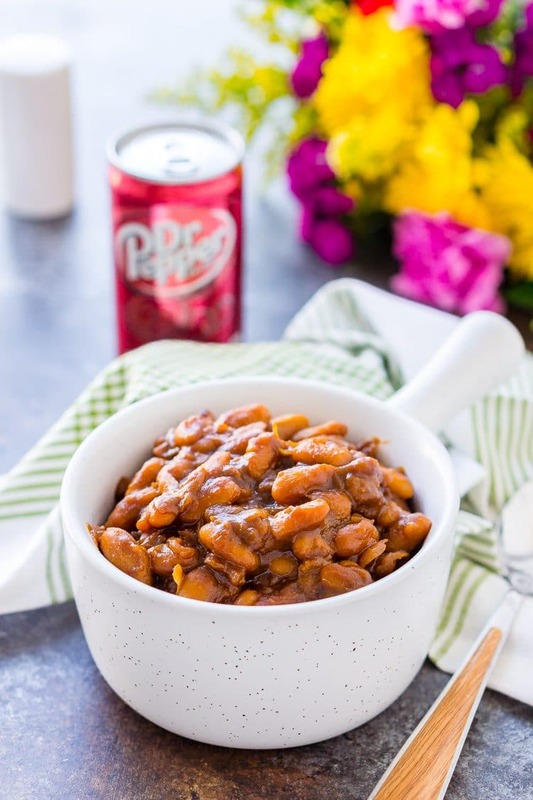 These Dr Pepper Baked Beans are sweet and delicious and ready in less than an hour! Add oil to a large pot and heat on medium heat, add in diced onions and garlic powder. Cook until soft, about 3 to 4 minutes, stirring occasionally. Add in beans and 1/2 cup Dr Pepper, stir and simmer for about 6 to 7 minutes. Add in remaining ingredients and simmer for another 8 to 10 minutes. Transfer beans to an oven safe dish and bake for 20 minutes. 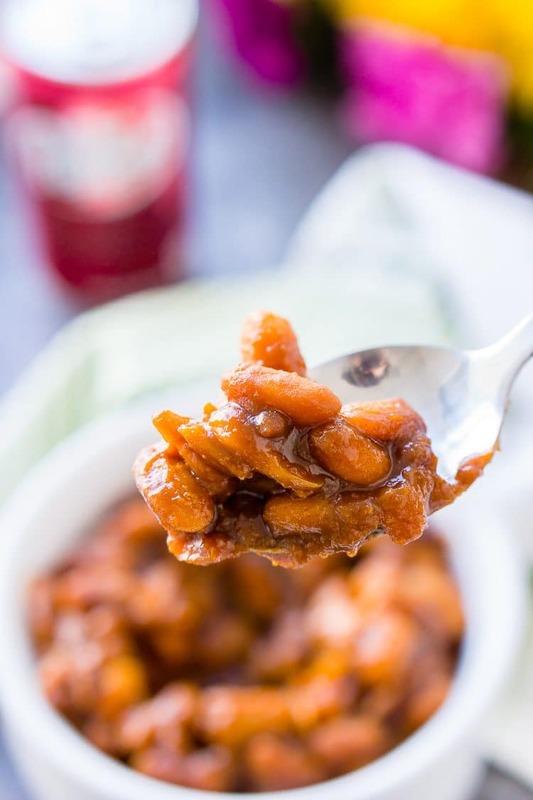 Pin this Baked Beans Recipe for Later! Thank you so much, Heather! Enjoy! My grandson said “these were the best baked beans and I don’t even like bean”s. He asked to make them for his friendsgiving today. I am so glad they are easy and quick. I’m so glad he loved them, they’re quite tasty! Can these be cooked in a slow cooker? I’m sure they can be, but I’m not sure on the timing, my guess is 3 to 4 hours. Can you make these with diet Dr Pepper? I don’t see why not, but I’ve never tried it myself. Just a quick question. Your written recipe calls for 1 c. Dr. P divided. 1/2 c. Goes into the beans whle on the stove. What do I do with the other 1/2 c.? Can’t wait to try these. It gets added in with the remaining ingredients, enjoy! Thank you so much for this delicious recipe! We enjoyed them. Hi Debbie, I’m so glad, it’s one of our family favorites too! Can this be made with Northern beans?? Hi Michelle, Northern beans may need to cook longer, but you can use Navy beans as well.